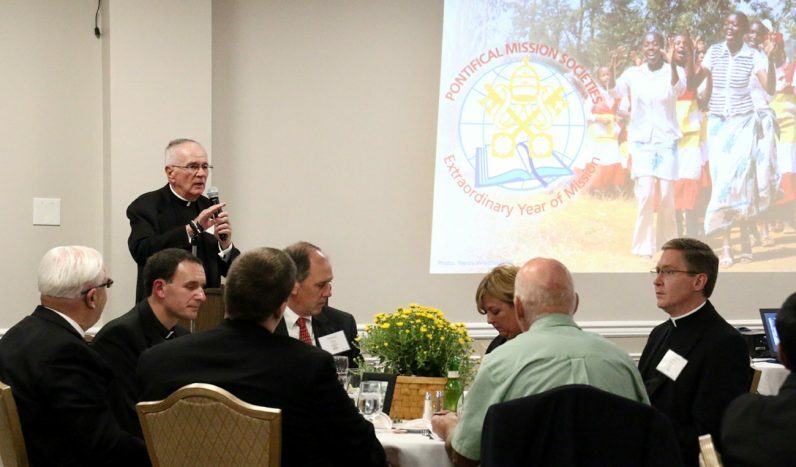 The Pontifical Mission Societies of the Archdiocese of Philadelphia celebrated their fourth annual World Mission Dinner and Ambassador Award ceremony Oct. 11. 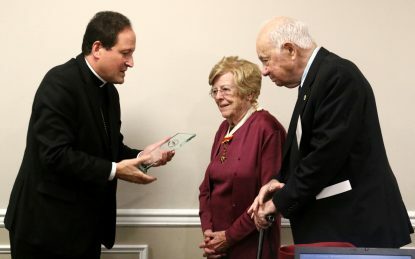 Arthur and Mary Anne Burke received this year’s award for their work with the Serra Club, which promotes vocations in the archdiocese, and their dedication to the Catholic faith as they demonstrate their calling to be missionaries through outreach to the mission dioceses throughout the world. The annual award honors those who live out their baptismal calling to be a missionary. To help bring people to a new awareness of the Christian baptismal responsibility for the church’s mission to evangelize, Pope Francis has declared October 2019 as Extraordinary Mission Month. In response to the pope’s call to mission, Archbishop Charles Chaput has declared an Extraordinary Mission Month in the Archdiocese of Philadelphia. This month’s World Mission Dinner served as one of the kick-off events for the Extraordinary Year of Mission. Funds raised through the dinner support missionaries serving people on the margin of society in 1,111 dioceses worldwide. The Pontifical Mission Societies aid the Holy See in these mission dioceses to help build up the local church, especially where Christianity is new. The societies care for and support these churches until they are able to be self-sufficient. As a sign of unity with the mission dioceses, Msgr. Arthur E. Rodgers, archdiocesan director of the Pontifical Mission Societies, welcomed seminarians from St. Charles Borromeo Seminary, where seminarians from Bangladesh and Sri Lanka continue their formation for the priesthood. Past distinguished recipients of the World Mission Ambassador Award include Msgr. James T. McDonough, former archdiocesan director of the societies (2006-2014); Joseph J. Sweeney Jr., who served the archdiocese for more than 30 years and was Secretary for Catholic Human Service until his retirement in 2015; Bishop Timothy Senior, rector of St. Charles Borromeo Seminary, who helped to raise awareness of the universal missionary work of the Church. Learn more about the societies and the Extraordinary Mission Month at the website PhillyMissions.org.